Home › Top › Thursday 20th of February, Bambu’ & Julien Tax present: Mix and food! 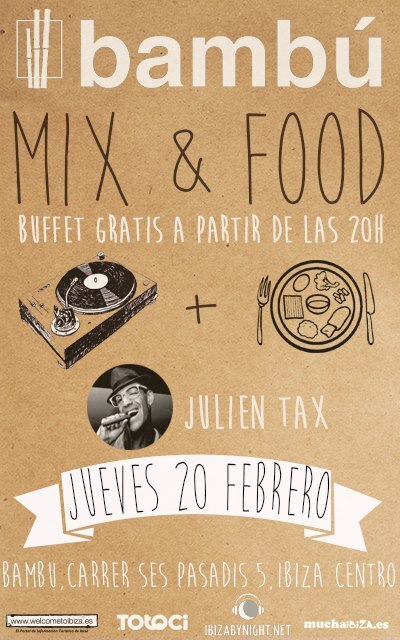 Thursday 20th of February, Bambu’ & Julien Tax present: Mix and food! Tomorrow at Bambu’ Ibiza, will be time of the cult aperitiv-dinner Mix and Food! The program of the party, that will start at 20,00, will include a free buffet! The soundtrack of the night will be by Julien Tax! ‹ Friday, Dunes Ibiza, Alex Andrè presents: Ibiza winter session!